Discovering the “know- how” on Sub-actions 1.1, 1.2, & 1.3 is a Gantalcalá initiative, ‘Youth in Action’ Programme. The project 1, 2, 3…Action! Discovering the “know- how” on Sub-actions 1.1, 1.2, & 1.3 is a Gantalcalá initiative, developed in the frame of the Youth in Action Programme, within the Action 4.3 (Training and Networking of those active in youth work and youth organisations). The aim of the project was to get together 34 youth workers from 16 European Union countries, to facilitate them the knowledge needed to make real future projects within the Sub-actions 1.1. Youth Exchanges; 1.2. Youth Initiatives; and 1.3 Youth Democracy Projects. The activities of this Project, addressed to the promotion of cooperation and training in the field of youth work, took place in Algeciras (Cádiz) from 7th to 14th November 2009. 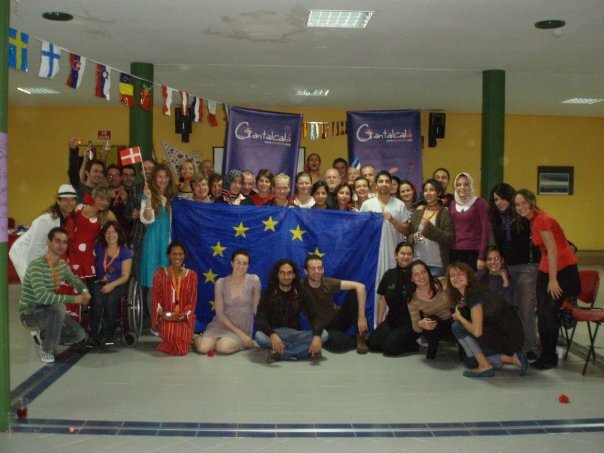 During these days, the youth workers took part in several workshops focused on the development of creative and innovative projects; they discussed about the European citizenship, the cultural diversity, and Environmental challenges; and they reflected on social inclusion and Anti-discrimination, being motivated to face the work with young people with fewer opportunities, particularly with disabled ones. The training course 1,2,3…Action! Discovering the “know-how” on Sub-actions 1.1 , 1.2 & 1.3 was organized by Asociacion Juvenil Gantalcala in co-operation with CGE, LJB, P2P, AKTI, Jammerbugt U, GVBN, Ayto, Algeciras, NGO Continuous Action, Avicenne, Provincia di Alessandria, Ungdomshuset Lagre, Urzad Miasta Torunia, TOMIC, YGR, GSLU, IMM. To facilitate participants practical knowledge for the preparation, implementation and evaluation of youth projects within Sub-Actions 1.1, 1.2 & 1.3 of the Youth in Action Programme. To increase youth opportunities by promoting cooperation between Public Administration and Social actors. To enhance the use of ICTs and Non-Formal Education in the Youth field. 34 participants from Austria, Bulgaria, Cyprus, Denmark, Estonia, France, Germany, Italy, Norway, Poland, Portugal, Romania, Slovak Republic, Spain, Sweden and Turkey took part in the Training course. The working language of the Training Course was English. Practical tools for youth workers in the frame of the Youth in Action Programme. Learning how to develop projects within Sub-Actions 1.1, 1.2 & 1.3 of the Youth in Action Programme. Use of creativity and innovation in youth projects. At the end of the training course, participants received the Youth Pass certificate, that describes and validate the Non Formal learning experiences achieved during this course.